As a young girl I was entranced by the Japanese mythology of the red crested crane. The story went that a red crested crane could live a thousand years and if you folded 1,000 origami cranes you got to make a wish for the sick to get better. 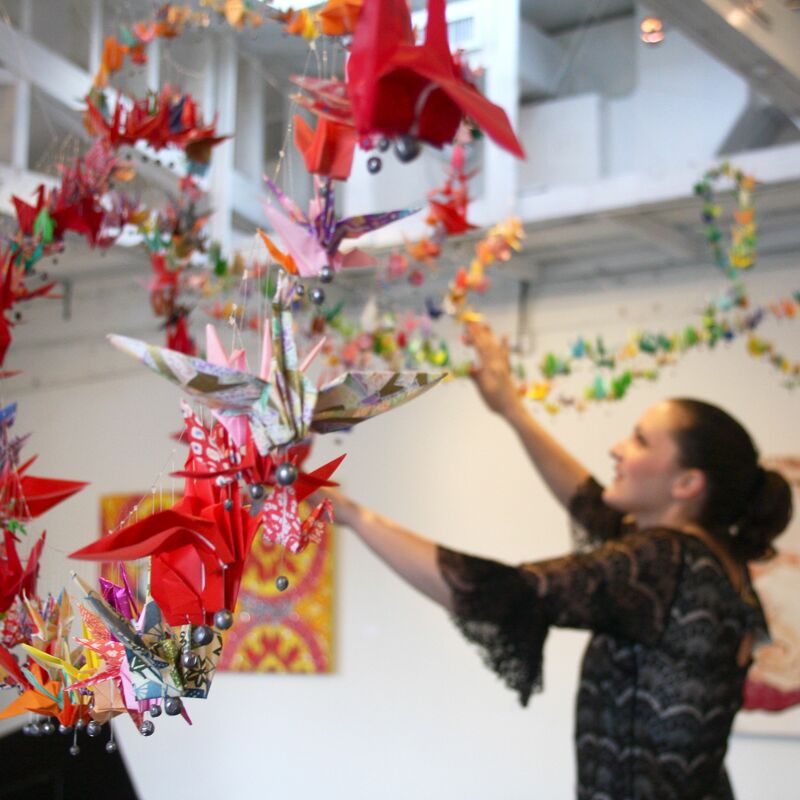 Growing up without religion in the home, the commitment of folding 1,000 cranes to make a wish was a practical form of prayer I could understand, having never been taught to pray. When my father fell ill, I struggled with how to cope with this adversity, I turned to folding a thousand cranes. It eased the helplessness I felt. Carefully selecting the paper for each bird and meditating on my purpose for folding them, the plan to set them to flight began to form. This began my installation work, completing a total of 3 flocks, each with 1,000 cranes: first, for my sick father (see image Hope); second, when our country went to war in Iraq; third, when my mother fell ill (see image Salvation). Creating a space for these origami cranes to fly was a way to share my hope, love and commitment to the wish I had made with others. The impact of seeing each bird with its space to fly, knowing that the hands of one person carefully crafted each one, resonated with my audience. I wanted to take this one step further by beginning a series of paintings featuring a solitary origami crane because as amazing as 1,000 cranes are. Each bird is very important to the whole; each crane should be cared for in the process. It is not just about the impressive whole, but each component. I feel that in my style of painting I am able to further breath life into the symbol of one solitary crane by placing it in real life situation where it gets to behave as a real bird would, riding with the current or the water, nestled amongst plants (see image Crane#5) and interacting with the human form so that it might take on greater symbolism as a talisman of hope. Then one might look at the entire flock and see that it is made up of 1,000 different personalities, spirits and moments of hope. Although the crane could be seen as little more than a child’s toy, in the setting of my paintings, the illusion becomes real and the cranes take on character, personality, and life. To truly express the hope of the crane, I have also created the juxtaposition of the crocodile, an ancient creature that represents ultimate destruction and fear in my dream life. It is by seeing the delicate nature of the origami crane against the brutal and rough nature of the crocodile that my audience is able to truly understand the preciousness of this paper bird and understands the human figures concern with guarding it (see image Guardian) and can feel the sadness of the human figures weakness and fear being great enough to sacrifice it (see image Concessions). My goal in the execution of this work is to create imagery just realistic enough to convince my audience that the world is real, while maintaining a painterly and interpretive approach that allows for emotionality in the work. Up close I like the strokes to inspire feeling and decisiveness.